Welcome to the land of Mountain Gorillas, who dwell in the thick rainforests of Bwindi. Track them along with our expert guides and observe their interesting behaviors. Also meet many other primates like Chimpanzees and several types of Monkeys as well as observe the throbbing birdlife of the region. The trip starts on your arrival at the Kigali International Airport, where our representatives will receive you and drive you to Bwindi in southwestern Uganda. We drive to Uganda via the Katuna border and it roughly takes 6 hours to reach our lodge. Please note that clocks go forward by one hour as you enter Uganda. With the volcanoes visible in the distance, the drive to Bwindi is through a scenic route, the road winding through many hills and valleys. We spend the next three nights in Bwindi Lodge, an eco-friendly lodge that overlooks the primeval Bwindi forest which is home to several primates and birds. It is a favourite haunt for the Gorillas and they are often found sleeping in the premises of the lodge! On reaching the lodge, you will get a briefing on your safari trip. Time permitting, you may go for a guided nature walk in the thick forest that is rich in birds, butterflies and monkeys. Alternatively, you may go for a short stroll around the lodge and enjoy the natural surroundings. Relaxing on the terrace of the lodge, that juts out into the forest, is an excellent way to unwind. Sit back and observe the exotic sounds around you that range from the birds chirping away in some tree top canopy or mammals calling on to their parter or a silver back Gorilla hooting at a distance. 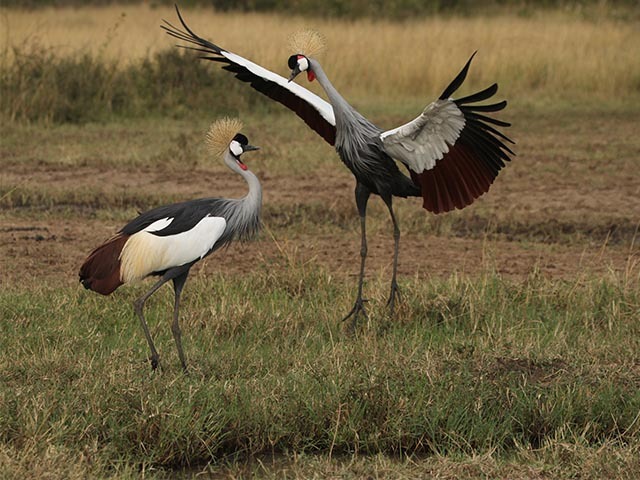 Uganda, is a landlocked country in East Africa, lying within the Nile Basin. Historically, the Bantu speaking groups were the original inhabitants of the area. The hunter gatherers dwelled here until 1700 to 2300 years ago. It remained a British colony from the late 19th century till 1962. Post independence, the country continued to experience political turmoil and power struggles between various groups. The agitations and wars continued till the early 2000s and with the ending of the five year long Second Congo War, peace returned to the region. Today we go Gorilla tracking in Bwindi Impenetrable National Park with our experienced trackers who follow the families of Gorillas everyday. These specialized tracking expeditions require extra payments that need to be paid in advance at the time of booking. 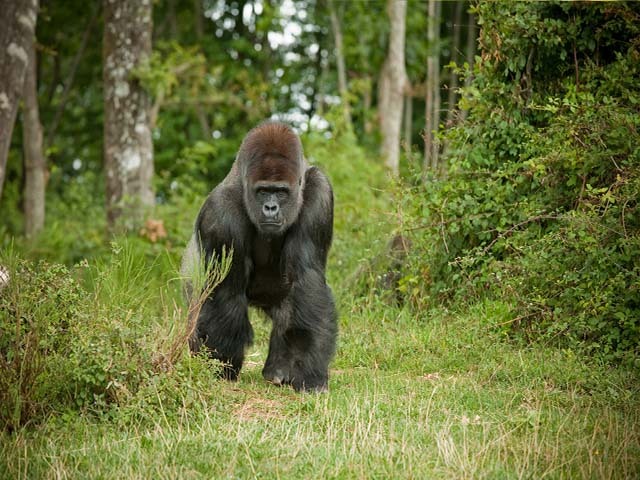 One of the best things about Gorilla tracking here is that ample care is taken by the authorities so that the independence of the animals and their natural ambiance is retained. Along with this, a steady source of income is maintained for the betterment of the local area. As a result very few visitors are granted permit each day and this further helps to retain the wilderness in the park. 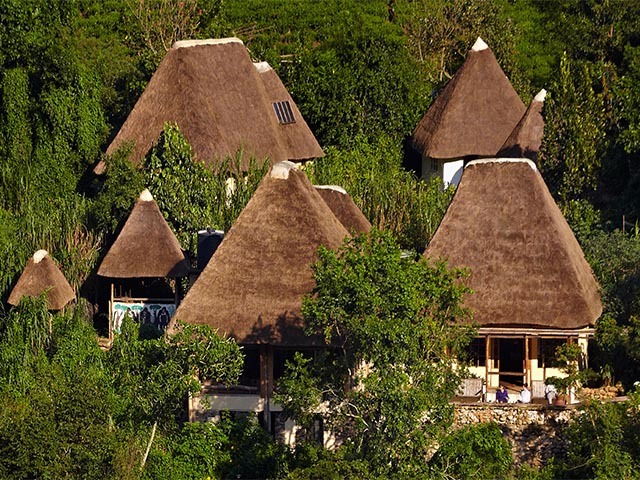 Nestled in the ridges of Albertine Rift Valley, Bwindi is said to be one of the very few places in Africa that survived through the last Ice Age. The park is perhaps best known for about 340 Bwindi Gorillas that live here and it roughly presents, half of world's population of Mountain Gorillas. The park, spread over an area of 331 square kilometers, is also a sanctuary for Black and White Colobus Monkeys and Chimpanzees among others. Besides, there are an estimated 120 mammal species in the park, which includes many smaller animals apart from primates. There are also about 30 Elephants here. The annual average temperature in the park ranges between 7-20 degrees Celcius. The periods of heaviest rainfall are March-April and again later around September-November and during these times access to the forest becomes all the more difficult. It is quite an adventure to walk up the steep and densely forested hills before finally coming across Gorillas camouflaged in the vegetation. It is an inspiring moment for most of the visitors! The Gorillas are gentle by nature and seldom become hostile towards tourists. Tracking in Bwindi requires stamina, mainly because of the hilly terrain and dense forests, and can often take most of the day. Bwindi, with one of the richest faunal communities in East Africa, is also a paradise for bird lovers. Set out on birdwatching to spot several birds such as Hornbills and Turacos. Most of the endemic birds of Albertine Rift valley can be seen here and that includes rare birds like the Short-tailed Warbler, Rusty-faced Woodland Warbler, Bar-tailed Trogon, Gruel's Rush Warbler, Wilcock's Honey-guide, Yellow-eyed Black Fly-catcher, Kivu Ground Thrush, Dusky Crimson Wing and White-tailed Blue Monarch. There is another chance to go Gorilla tracking today. If you haven't spotted the Silver Back Gorilla yet, here is another chance. It is an adult male Gorilla, with silver hair on its back, on which lies the onus of leading the group. Although Gorillas are gentle beings, care should be taken to maintain a fair distance from them as they can be disturbed by the slightest provocation and turn wild. It is advisable not to speak loudly in their presence. They should not be offered food and visitors should avoid eating around the vicinity of the gorillas. Also, remember not to use flash photography while taking pictures of Gorillas. Those interested in doing something else, can go for a guided nature walk in the thick forest to look out for spectacular birds residing here, amazing butterflies and other mammals including several types of primates. The are about 4 hiking trails in the park for the visitors to explore the rich diversity of the area. The park is home to about 10 primate species that includes the common Chimpanzee, L'Hoest's Monkey, Black and White Colobus Monkey as well as Red-tailed Monkey among others. Alternatively, you can choose to stroll around the lodge or go for a walk to observe the local communities and projects that are being run around the area. Today is the last day of your trip. We leave for Kigali via Kabale and Katuna. Please remember to reset your watches as clocks go back one hour on leaving Rwanda and entering Uganda. Kigali is the capital and the largest city of Rwanda and is the hub of the political, economic and cultural activities of the country. It is also well connected by other international destinations. Time permitting, grab a chance to go for a tour of Kigali city as well as visit the market, handicraft shops and a pottery project. The genocide memorial in the city, built in the memory of mass murder of an estimated 800,000 Tutsi people in Rwanda that happened in 1994 over a period of 100 days, is also worth a visit. The man slaughter was organised by the Hutus tribe after the assassination of their leader Juvénal Habyarimana. The spot is the mass grave of the victims and holds permanent exhibition for the benefit of those who survived. Later you will be transfered to the airport in time for your flight back home. Please note: Accommodation providers are subject to change without notice. The accommodations listed in this dossier are our preferred suppliers, but sometimes due to availability issues, we are unable to make use of the properties listed in this dossier. If we cannot use an accommodation provider as listed we will substitute another property of similar standards. However, en-suite facilities are not always guaranteed.